Welcome to the second ZAP Newsletter. And apologies for the delay - 2.4.3 took longer than expected, and last week I was away at a Mozilla work week. This is a development and bugfix release, for more details of all of the changes see the release notes. If you’re a ZAP contributor then you can get one for free (just ping me first) and if you’re getting a load for a ZAP talk or training session then get in touch as well - we’ll do our best to help cover the costs. And please vote for ZAP in the Toolswatch Top Security Tools of 2015! Many add-ons have been updated in ZAP 2.4.3, but in most cases these have been for relatively minor enhancements and bug fixes. Add HTTP processor for tagging fuzz results. Show the number of payloads from the script in Fuzzer dialogue (1887). Allow to modify the selected Payload Processor script. Show current payloads when adding/modifying processors (1898). Allow to preview processing of payloads (1931). Allow to save (to file) String, Regex, File and Script payloads (1932). Add support for regex repetitions (1885). Allow to modify the payloads of File and File Fuzzers (1897). Image Location Scanner detects more GPS tag varieties, scans png & tiff files, adds i18n. The Docker weekly and stable containers now support virtual displays. The zap.sh script works as before, but a new zap-x.sh script has been added which starts xvfb (X virtual framebuffer) in the background and means that you can use Selenium based add-ons like the Ajax Spider and DOM XSS scanner with ZAP in daemon mode. This section will teach you more about a different ZAP feature every month, starting with the Check for Updates functionality. ZAP in an intercepting proxy, which means that you can intercept and change anything that is proxied through ZAP. In order to tell ZAP that you want to intercept requests or responses you need to use break points. All break point options are configured via the Options/Breakpoints screen. You can change anything you like in the Break tab, you can even change binary data using the Hex views. The intercepted message will stay in the Break tab until you press either the ‘Submit and step’ button (which will submit the message and intercept the next request or response), the ‘Submit and continue’ button (which will submit the message and unset the global break point) or the ‘Bin’ button which will drop the message. By default the global break point affects all messages - you can change it to just apply to messages that are in scope via the options. You may find that some applications continually make requests, making it difficult to find and intercept the one you are interested in. If you encounter this situation then you can use custom break points. This dialog allows you to create a custom HTTP break point that will only be hit when specific conditions are met. You can perform exact or regex matches against the URL, request header, request body, response header or response body. 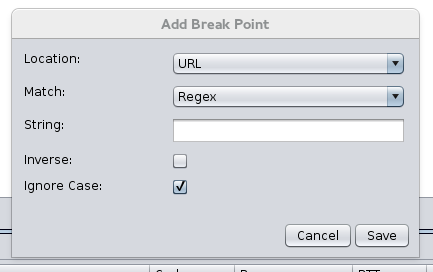 You can have as many custom break points as you need - they are listed in the ‘Break Points’ tab from where they can be enabled, disabled, edited or deleted. Break points are not restricted to HTTP(S) traffic - they are also supported for websockets and client side messages. Both of these also support custom break points via buttons on the tool bars for the respective tabs. 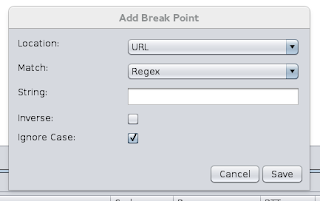 If custom break points still don’t provide you with enough flexibility then you can trigger break points from within proxy scripts. Calling msg.setForceIntercept(true) in either of the proxyRequest(msg) or proxyResponse(msg) functions will trigger the break point, and this will work in any text based scripting language. Zest (which is graphically based) also includes a ‘break’ action statement that has the same effect. Being able to trigger break points via scripts means that you can trigger them for exactly the conditions you are interested in, however complex they might be. Each month we plan to cover a 3rd party tool that is related to ZAP in some way. These tools can be open source, closed source, free or commercial. ThreadFix is an application vulnerability management platform that allows organizations to create a consolidated view of their applications and vulnerabilities, prioritize application risk decisions based on data, and then translate vulnerabilities to developers in the tools they’re already using. With ThreadFix and OWASP ZAP, a security analyst can keep track of their application portfolio – laying out the various teams developing software and the applications each team is developing. Then, for each application, results from application scanning with ZAP can be uploaded and tracked over time. These results can be de-duplicated and correlated with other static and dynamic scanners, providing a comprehensive view of the results of security testing. In addition, ThreadFix can bundle vulnerabilities together and create bugs and software change requests in defect trackers such as JIRA and Bugzilla. Directly export ZAP scan results into ThreadFix, saving time. Pre-seed ZAP scans with application attack surface information when given access to application source code. This allows application testers to increase the coverage of scans by identifying “hidden” landing pages and input parameters that might not be found by a standard application spider/crawl. In addition to the capabilities of the open source ThreadFix Community edition described above, ThreadFix Enterprise provides security teams the ability to schedule and execute scans with headless ZAP clients and have those results fed directly to the ThreadFix server. This allows security analysts to set a baseline level of scheduled scans and allows development teams to self-serve ZAP scans via the ThreadFix API. And each month we plan to introduce you to one of the many ZAP contributors. I am a security engineer in Japan. I was web application developer. I make use of my past experience to spread ZAP in Japan. I am participating in the security competition called Capture the Flag (CTF) as the Japanese team. I has participated domestic and foreign countries competition(such as DEFCON). Mainly in Japan, I participate various working group in OWASP Japan Local Chapter. For example, I made skill mapping of vulnerable assessment, and requirement definition document of web application or system. Mainly, I am working activity of ZAP about the three points. 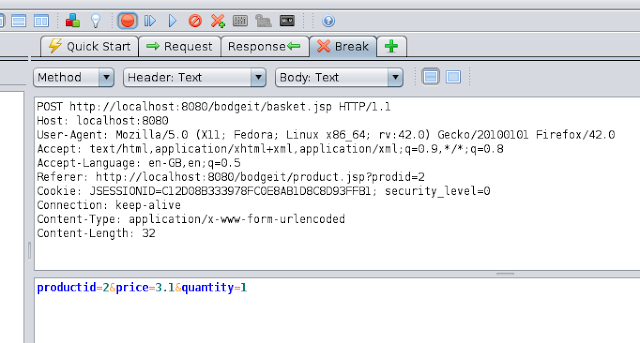 How to use ZAP and find vulnerable of web application. presentation and hands-on session of ZAP in Japan. My activity mainly spread ZAP knowledge in Japan. There is OWASP Japan Local Chapter in Japan. Mainly, I introduce ZAP in OWASP Japan. In other, I made Japanese ZAP Manual. OWASP Japan released this manual on web site. I recognized to be used ZAP on many users in Japan. I am so happy to be able to contribute. I continue to spread activity. And then, I will go ahead with translate of ZAP. I want everybody to know that ZAP is easy to use. I'd like to contribute to ZAP project. I like ZAP project. I'd like to contribute with other contributor in ZAP project. And then, I hope that many user will use ZAP. So … did you find that useful? Welcome to the first monthly ZAP newsletter. We plan to cover pretty much anything ZAP related in these newsletters, including newly created or updated add-ons, new features just implemented and 3rd party tools. We also encourage contributions from people like yourself - see the last section for details. Oh, and please let us know what you think of this newsletter via the Feedback Form! The big news this month is that we will be releasing ZAP 2.4.3 very soon, ie hopefully in the first week of November. This will be an enhancement and bug fix release, and as always we recommend you update asap. If you do listen to it then please fill out the feedback form linked off that page. 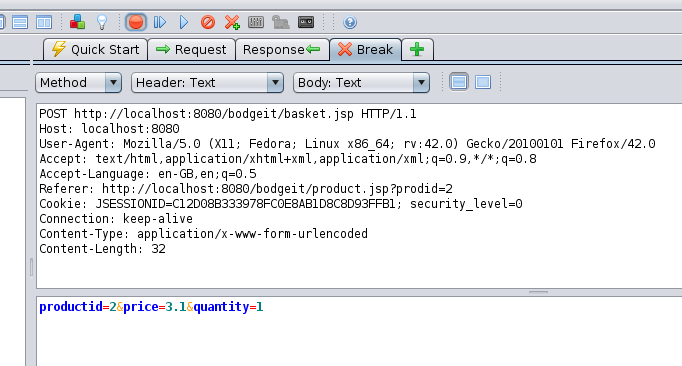 An Active Scan rule for detecting DOM XSS vulnerabilities. It launches browser windows and sends attack payloads to all of the relevant DOM elements. Context Alert Filters allow you to automatically override the risk levels of any alerts raised by the active and passive scan rules within a context. Have you ever wanted to be able to browse an application you tested with ZAP at a specific time, perhaps when you dont have access to it, or after its been changed in some way? If so then this add-on is for you! The add-on allows you to instruct ZAP to return content from the ZAP history between specified dates rather than forwarding the requests to the site. This allows you to apparently browse and use a website that you no longer have access to. It also allows you to see what it looked like at between specific times, which is useful if the application has since changed. The ZAP command line has been enhanced to support updating add-ons. These options take effect before other command line options such as ‘-quickurl’ so that add-ons will be installed and updated before attacking a target application. ZAP has been enhanced to add the concept of ‘data driven content’ - path elements that represent data rather than the structure of an application. This is a problem because ZAP will now attack all 3 pages when it only needs to attack one of them. In this case attacking the same page 3 times is not a big problem, but if you have hundreds or thousands of pages like this then the default behaviour will significantly increase the time it takes to scan the application. The 'company' nodes are 'data driven content' - URL parameters that contain data instead of representing part of the application structure. You can now define data driven content by adding the application to a Context and then configuring them via the Context Structure page. The characters « and » are used to indicate that this is a 'special' node and the node name (in this case 'company') can be set by you to indicate what that node represents. ZAP is currently the most actively developed open source web application security tool, and we are continually adding new features and fixing bugs. ZAP is made up of the ‘core’ and an ever growing number of add-ons. Anyone can develop ZAP add-ons, not just the ZAP 'core team'. In order to update the core we have to release a new version of ZAP, but add-ons can be updated at any time. For this reason we are trying to move as much functionality into add-ons as possible, even features that you might think of as being essential to ZAP, like the scanner rules. All new add-ons start off as alpha and only progress to beta and release after suitable reviews. The Check for Updates component is the way you can keep your copy of ZAP up to date. You must select this option in order for the Check for Updates functionality to work. This is very strong recommended - see below for the details of what will happen if you select this option. If selected then new versions of ZAP will be downloaded when available. You will be prompted to install them when you restart ZAP, but you can choose not to. If selected then you will be notified when you run the ZAP UI whenever there are newer versions of any of the add-ons you have installed. This is strongly recommended. 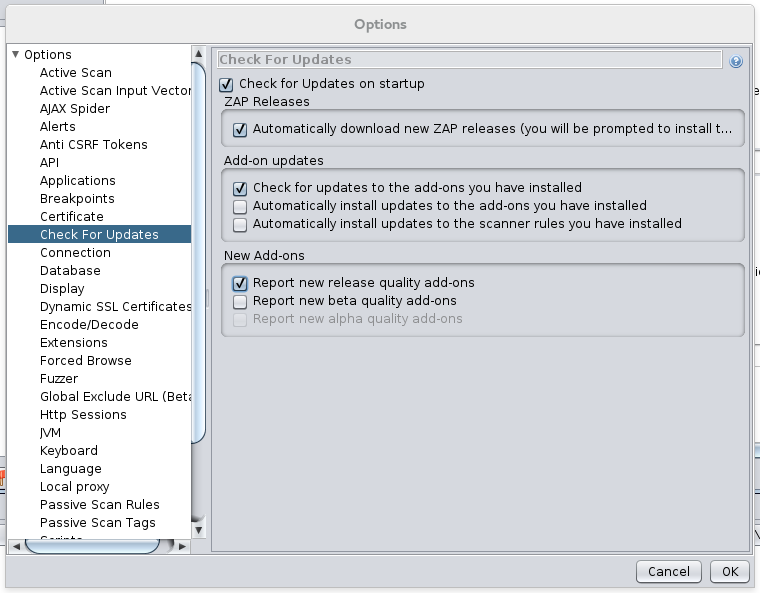 If selected then ZAP will automatically download and install updates to the add-ons you have installed. This is recommended, but we understand that not everyone will want to do this. If selected then ZAP will automatically download and install updates to only the scanner rules you have installed. This is very useful when using ZAP in a Continuous Integration environment. If selected then you will be notified whenever new or updated add-ons of the relevant quality are available, even if you don’t have them installed. This is an easy way for you to learn about new functionality as soon as it becomes available. If you do choose to “Check for Updates on startup” then ZAP will make one request to a ‘Bitly’ URL. The only information about you that is included in this request is the version of ZAP you are running - we need this to be able to determine which add-ons and associated versions are suitable for you. The Bitly URL resolves to an XML file on GitHub which gives full details of the latest ZAP release and the add-ons available for the release you are using. All downloads are served over HTTPS and are checked against the hash included in the XML file. ZAP will not install any add-ons downloaded over HTTP or which do not match the specified hash. The Check for Updates code is in the zaproxy org.zaproxy.zap.extension.autoupdate package - if you have any questions on how it works then just ask on the ZAP Developers Group. How to automatically perform automated security testing of a web application and have those tests run as part of a continuous integration/deployment pipeline? How to define the security requirements of a web application so that they are visible and useful to developers and don't become out of date as the application grows? By using a BDD framework like JBehave (www.jbehave.org), we can write automated acceptance tests for security in a natural language syntax that is understood by all members of a technical team: developers, operations, security, QA and business analysts. At the same time these tests can be run as if they were normal JUnit tests and included in a build pipeline, allowing the test owners to decide on the passing and failing criteria for each test. The framework includes a default “baseline” set of tests which are broadly applicable to a range of web applications and includes tests against the SSL configuration, HTTP server headers, Authentication, Session Management as well as automated vulnerability scanning using ZAP and Nessus. BDD-Security uses OWASP ZAP as a key component to performing the non-functional security tests aimed at the web tier, and uses ZAP's extensive API to perform spidering, scanning and re-sending of captured requests. The other key component is WebDriver (Selenium) which allows the tests to navigate the application and submit forms. Combining these two components means that it's possible to mimic the behaviour of a security analyst and any test cases that they could perform manually, can now be recorded using JBehave + WebDriver + ZAP. A: Rick (aka Kingthorin). AppSec guy, breaker of things. A: In my day job I break stuff: I do Vulnerability Assessment and Penetration Testing. Developers or SysAdmins having a bad day is generally a good day for me. A: It's different from my day job. I spend all day figuring out how other people's systems and apps are or can be broken. Contributing to ZAP gives me a chance to build something. The contrast is nice to have, plus it forces me to grow in different ways and see technology from a different angle. A: I do some development work, take part in the user and dev forums. Ask lots of questions, rock the boat (a little ;). A: Hmmmm that's an interesting question. I have ideas for a few different extensions that I haven't had time to tackle yet. Hopefully in late 2015 or sometime in 2016 I'll talk myself into tackling those. A: Everyone is supportive and encouraging! A: I get to make a great Open Source tool do things I can use in my day job, and help others to do things they need in their jobs. It also forces me to learn about things like Git/Github, and simple web development tasks in generating content for ZAP PoC testing, etc. Of course it helps me learn about Java and software development itself. A: Just do it! Jump in with both feet, deep end of the pool. There's no time like the present. People here will help you, support you, encourage you, and in a good way (a great way) challenge you. There are so many ways you can contribute - Community Scripts, fixing or enhancing code based on issue tracker on Github (or your own ideas), developing your own extensions, writing tutorials, making training videos, etc. A: I've also contributed to the OWASP Testing Guide and OSSTMM in the past. As for other Open Source software projects, no yet, though because of ZAP I have plans and a few ideas floating around the back of my head. A: Outside of work I like camping, gaming (I started playing WoW on day one of release and still play), geocaching, and cooking. A: There really isn't much I dislike about it. Most of the things I dislike on are my side of the equation. Not having enough time and not actually being a Java dev. A: From my point of view: The one thing I think we need to get better at is promoting scanners Alpha > Beta > Release. Sadly I don't have any ideas for solutions, but it would be really nice if we could somehow gather stats or get users to provide feedback on usage, false positives, etc. I often wonder if we have 100s or 1000s of users, how often they use ZAP (everyday, every project, every assessment.....), what functionality they use (mostly proxy, mostly point and shoot, totally active with user auth setup, etc. ), only release rules or all 3 qualities. I know we've done surveys/questionnaires in the past, what kind of response rate have we had?